I recently gave a review regarding “Princess Lover”, a rather standard romantic comedy anime. It was a fan-service heavy eroge game, which became a fan-service heavy manga, which became a fan-service heavy anime. OK, the above picture never happened in the anime, but it skated pretty close to it. They later came out with two OVAs. The first one was a six-episode offering. If you didn’t have the time to invest 300 minutes to watch the entire series, you could cough up 16 minutes to get an overall sense of the show, but not get a good feel for it. Look, if you don’t have the time to watch anime in its entirety, then go watch something else, like “Schoolhouse Rock” or “Foul-Up, Bleeps and Blunders”. Anime does require your attention. OK, this is another standard entry into the Wonderful World of Romanic Comedy anime. Now, this started out as a fan-service heavy eroge game, to become a fan-service heavy manga to arrive at a fan-service heavy anime. 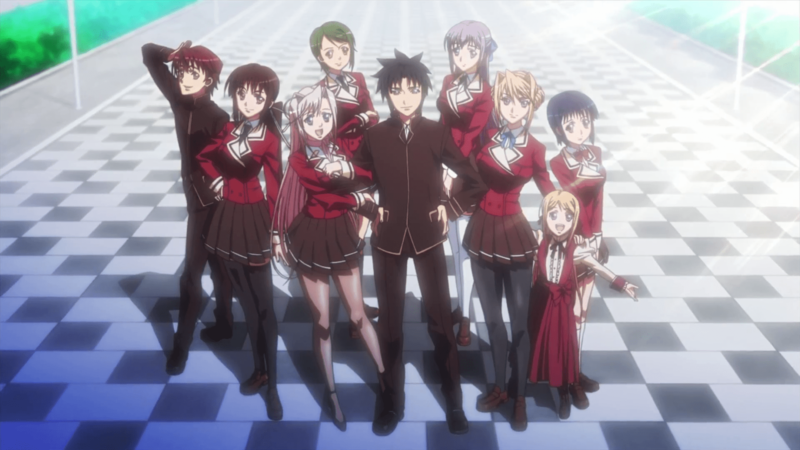 “Princess Lover” tells the story of Arima Teppei (Mr. Akimbo in the center). He is just your typical high school student with two standard parents. Or so you think. Sadly, Mom and Dad are killed in a car-jacking and the real truth comes out. Mother Kanae is actually the daughter of Isshin Arima, president, CEO, COO, LSMFT of the Arima Group, potentially the most powerful corporation in Japan. Mom was slated to take over when Isshin became worm food. Well, that got knocked into a cocked hat, so gramps adopts Teppei and sends him off to Shuuhou Gakuen, a high school only for wealthy students, so he can learn to take control off the company when the time comes for him to take control of the company.